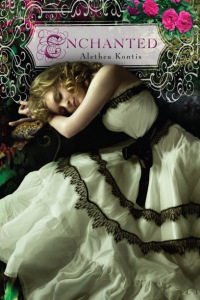 Think of your favorite fairy tale and chances are good that at least a part of it is in Alethea Kontis's Enchanted. The story opens with seventh daughter of a seventh daughter, Sunday, writing down her family story when she is interrupted by a talking frog. Everyone knows that a talking frog is an enchanted frog who must be kissed for the spell to be broken. After a friendly conversation Sunday complies with the frog's request for a kiss, but he remains a frog. Luckily they live in fairy tale land where insta-love is not only common, but encouraged, so it only takes three days for her love to be strong enough to transform him back into a man. Unluckily for Sunday she misses the transformation and assumes her beloved frog has perished in a storm. Doubly unlucky for her, her frog has turned into the very Prince thought to be responsible for her older brother's death and her family's misfortune. How can Prince Rumbold convince her and her family that he deserves her love? There are elements of Cinderella, The Frog Prince (obviously), Jack & the Beanstalk, folklore (seventh son stories), fairies, godmothers, and probably more I am forgetting. Fairy tale fans will be entertained by spotting all the references and seeing how Kontis weaves them into her larger story. Kontis does a good job of borrowing familiar elements but still writing her own tale. This is a delightful story sure to please readers.